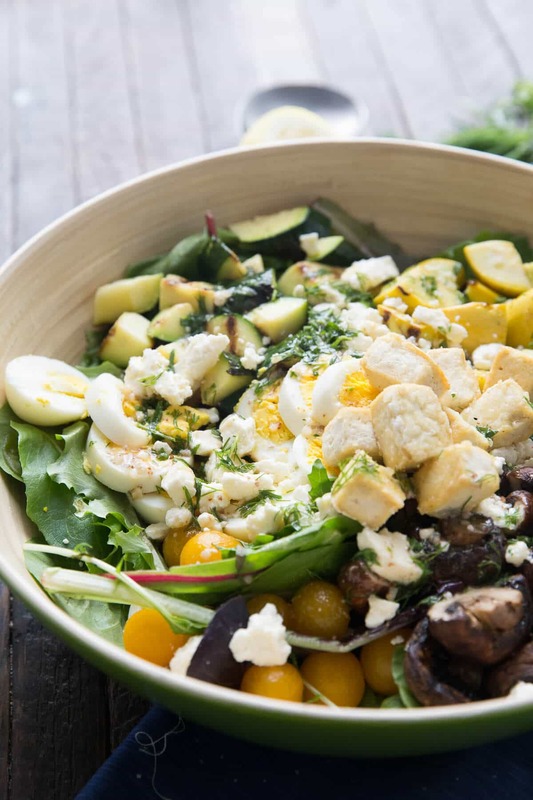 Everyone loves a good Cobb salad and this one does not disappoint! 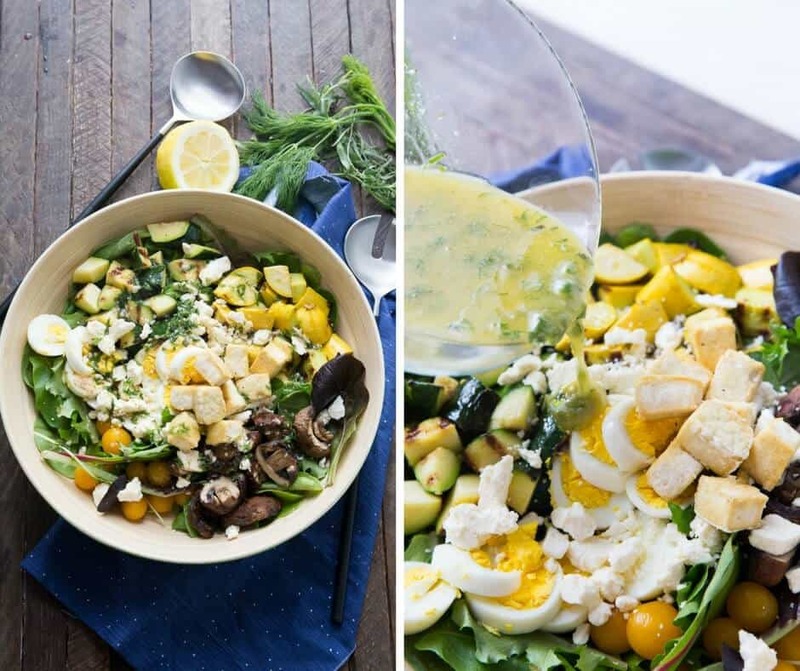 This lean version features good for you grilled veggies, eggs, and a simple herb vinaigrette! I’m proud to have partnered with Pompeian to bring you this original recipe. Each family get-together is filled with LOTS of food. We are Greek, we like food. Between my mom, my sisters and I there is typically enough food to feed a village. And we are ok with that because we love the leftovers. Mom typically brings the main course and her famous roasted potatoes, my oldest sister brings several sides and at least one appetizer. I add several appetizers like this outrageously good hot corn dip or the “fried” pickle dip and my middle sister brings one salad. While my middle sister may only be contributing a salad, I’ll tell you, it’s usually the best darn salad you’ve ever had! The best until now that is. 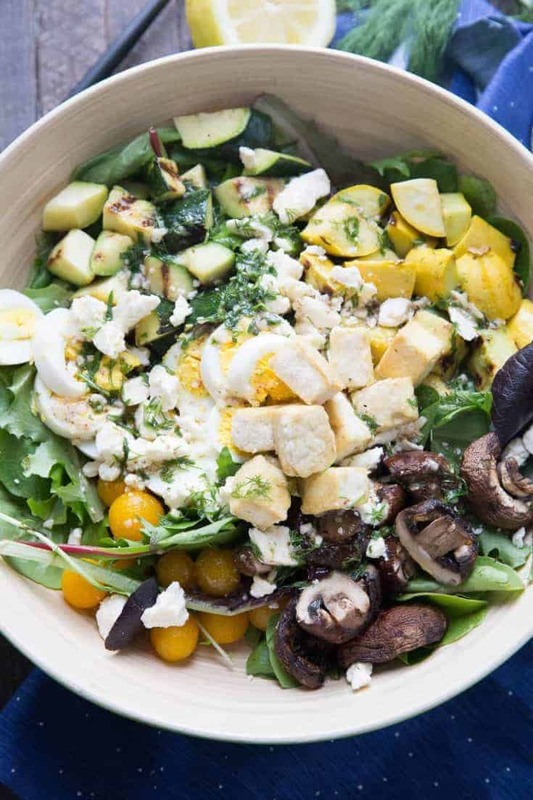 This cobb salad is a doozy. It really is a meal all on its own. This salad is full of greens and goodness. I topped romaine lettuce with grilled squash, zucchini, and portobello mushrooms. Fresh cherry tomatoes add a pop of color along with the hard boiled eggs. Tangy feta cheese is mixed in along with a very simple, herb vinaigrette. Each ingredient in the salad plays a huge part in the outcome, but the vinaigrette steals the show. 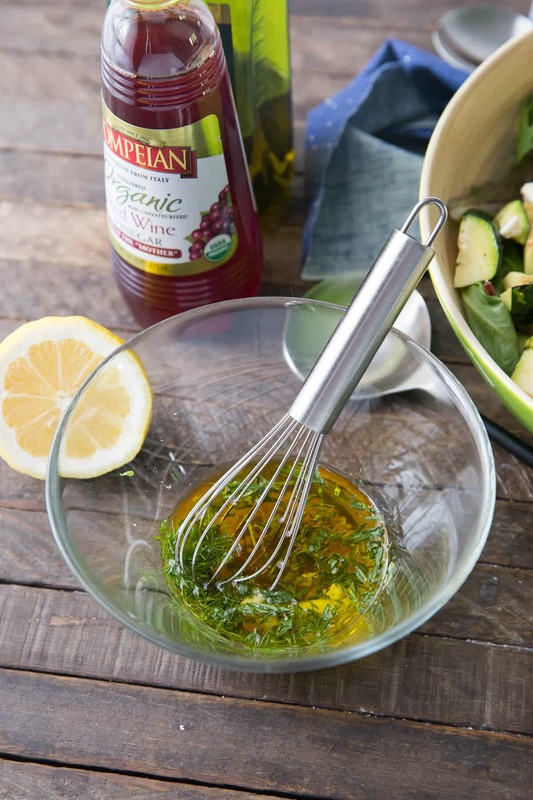 The vinaigrette starts with Pompeian Organic Red Wine Vinegar that is mixed with a little stone-ground mustard and fresh herbs. The red wine vinegar is crisp and fresh and made with organic grapes that were harvested at just the right moment. The vinegar is sulfite free, Non-GMO verified and certified organic too. The herbaceous vinaigrette makes the perfect coating for the freshly grilled vegetables and the soft cheese. While this is a meatless salad, I did add some toasted tofu croutons for protein. I tossed my tofu with Pompeian Robust Olive Oil, garlic, salt, and pepper before roasting. Feel free to omit the tofu, I know that is not for everyone. Keep this salad vegetarian or add lean chicken instead! Pompeian knows that for today’s home cooks, mealtime is not just about fueling up, it’s about experimenting with the latest food trends to create shareable, Instagram-worthy dishes. Thanks to Pompeian’s ongoing commitment to quality and innovation, home cooks can depend on Pompeian’s high quality olive oils and vinegars as a great-tasting base while exploring new flavors and ingredients. Preheat an outdoor grill to medium heat. Slice squash and zucchini and place on the grill along with mushrooms. Grill vegetables over medium heat for 3-4 minutes per side or until slightly soft. Remove and set aside. 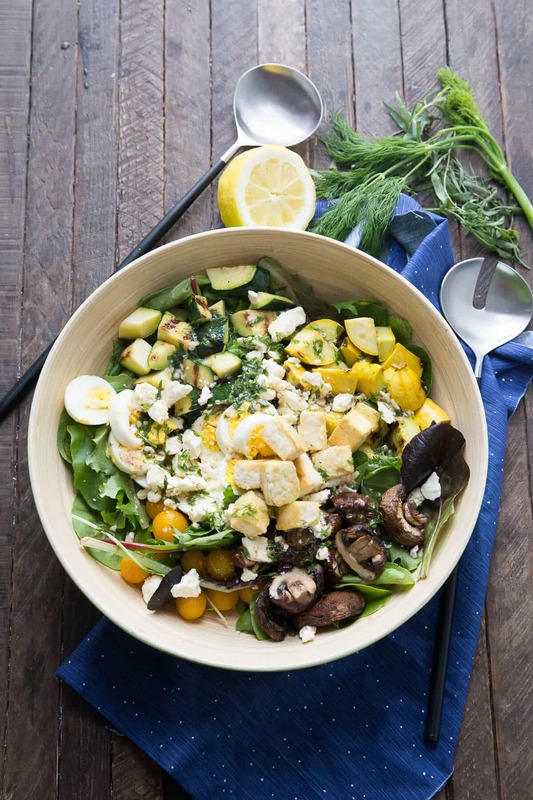 In a large bowl, combine romaine, vegetables, cherry tomatoes, hard boil eggs, and feta. In a separate bowl, whisk together the vinegar, mustard, garlic, salt and pepper, olive oil, lemon, and herbs. Drizzle dressing over salad tossing to coat. Add tofu croutons if using. To prepare tofu, wrap 1 package of extra firm tofu in paper towels and set on a plate. Place another plate or a skillet on the tofu and allow it to drain for 30 minutes. When ready, preheat oven to 400 degrees. Cut tofu into cubes, toss with a tablespoon of olive oil, one clove of minced garlic and salt and pepper. Bake for 40 minutes, turning often. I never would have thought to grill cobb salad toppings. Love it. Glad you reminded me of options with a Cobb. 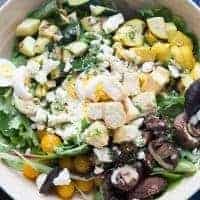 We are still working to get a good dressing for a Cobb salad. So, I plan to use your snippet above for dressing and see how it tastes. Thank you for posting.